As expected (by me and 59 million other Americans,) Barack Obama was re-elected yesterday as president of the United States. I was happy for him and his family, and the people in Obama, Fukui-ken and Obama Onsen in Unzen, Nagasaki, who were rooting for him!! Although the middle-income families in the U.S., including myself, saw a general decline during the past four years in their living standards, I truly believe that Barak Obama did a great job saving the auto industry in America from going bankrupt, going to bat for the lower-income families in their health insurance coverage, and ending the war in Iraq. I believe he is for the poor, including Asian Americans, Blacks and Chicanos. He will continue to work hard for maintaining the balance of power in the Far East, protecting Japan against China, North Korea and Russia, I believe. I voted for Obama. Al is a Sansei attorney, graduate of University of California Law School at Berkeley, a member of the state prosecutor’s office, a school board member, a former teacher, and a former president of the Torrance-Kashiwa Sister Association. He was born in Okinawa; his father was a civil service employee of the U.S. Department of Defense during the post-war days in Okinawa. His lovely wife is an intelligent person from Japan who speaks fluent English. He is the father of a young girl. I met him and his family at a rally at the home of a fellow Faith United Methodist Church member, Kanji Sahara, in Torrance. 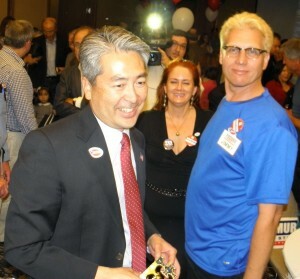 I am sure Al Muratsuchi will do a great job for all the citizens of 66th District and Californians, regardless of race, national origin, color or creed, in Sacramento, the capital of the State of California. Obama did take the first step in helping the US to catch up with other developed nations in terms of health care. However, he certainly did not “go to bat for the lower-income families in their health insurance coverage.” Going to bat would have been pushing for a public option which would have forced prices down. The net effect of the plan we have now is that soon lower income families will have to pay for expensive coverage they can’t really afford…which is why they weren’t covered in the first place. Obama went to bat for the insurance companies. But thank you for telling me that Sacramento is the capital of the state of California. Craig Huey is a Christian who endured $3,000,000 of vile slander and filth thrown at him by Muratsuchi and the Democrats without ever responding in kind. This letter to the editor was truly eye opening as to what goes on inside the mind of a liberal.